Black Ops by Frontline Labs are mixed and bottled in the UK. 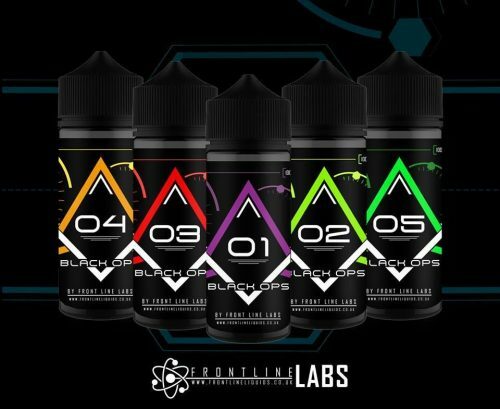 Designed for creating big clouds and flavour, the Black Ops range are all vapers favourites… every one is the kill shot! Black Ops e-liquid by Front Line is recommended for use with sub ohm tanks and kits because of its 80% VG ratio. This ratio also allows for a balance between cloud and flavour production when vaped. Available as a 100ml shortfill, each bottle has room for 20ml of nicotine in way of nicotine shots. For example, adding two 18mg, 10ml nic shots will create 120ml of 3mg e-liquid. These can be selected at the dropdown as x2 Nicitup or upgraded to salt nicotine by selecting x2 Dr Salt. 01 – Blackcurrant with an underlying dash of lemonade, a hint of lime rounded off with a low mint. This really is a killer flavour! 02 – A classic citrus lemon and lime with an undertone of orange… this will never be under the radar! 03 – A straight up sweet strawberry with creamy vanilla custard, for those who love a dessert vape… the whole squad will want this one! 04 – A blend of sweet pineapple, tangerine and strawberry with a twist of grapefruit. Call in the cavalry… this is a force to be reckoned with! 05 – A tropical mix of watermelon and coconut with an infusion of juice berries. You will always be on the lookout for more of this e-liquid!